The P3 method© is a distillation of the concepts and ideas compiled by Frank Reilly (1906-1967), whose quantification and clarity around the subject of values in painting to create the illusion of form, laid the foundation for many of today’s most successful artists and illustrators. Although he never wrote it down, many of Reilly’s disciples have written books on his method and theories. Most of these books are quite technical but the basic concept is really quite simple to understand. Reilly was part of the lineage of illustrator/artists like Howard Pyle and NC Wyeth. The system was passed down to me through my father, internationally known portrait artist, Joseph Maniscalco. His fellow students include James Bama and Clark Hulings, two of the most successful Western Artists of the last century. The Reilly method was an attempt to develop a common language for artists, a set of standards by which representational artists could establish a solid foundation of seeing and expressing the natural world.I have distilled the system to it’s essence with the P3 method. In order to use color effectively we must understand its various components. All colors have a specific hue, value and chroma. Albert H. Munsell, (1858-1918) devised a system of measuring and identifying these various components of color to take the guess work out of matching or describing a color. The Munsell system became the standard used by the Bureau of Weights and Measures for printing in the early 1900s. Value-based painting means we are emphasizing the lightness or darkness of color over the other elements. In other words, we are not distracting ourselves with vague, poetic descriptions of color like “beige”, “scarlet”, “puce,” or even terms like “bright orange,” which are very subjective. In fact, any color can be assigned a Munsell number sequence representing its hue, value and chroma. 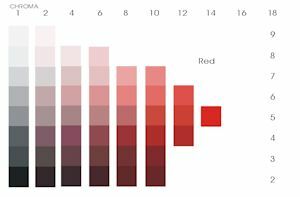 The 12 basic hues above are described simply, for example, R for red, RO for reddish orange, etc. All colors from the color wheel can be expressed by a value range from 0 to 10. Notice the vertical axis. It expresses a range of values from dark at the bottom to light at the top. There is also a scale of 0 to 18 on the horizontal axis that expresses a color’s chroma, the degree it departs from neutral gray. All colors can be described with the hue, along with its numeric value and chroma . Notice Cadmium Red out of the tube is “R 5/14,” (depending upon the brand). Notice Cad. Red or R 5/14 is the most intense chroma possible with red. Notice also it is a relatively dark color, a value of 5. To make red lighter you have to add white, which reduces its chroma. The Power palette is a reduction of neutrals, reds, yellows and “flesh” colors arranged by value. Keep in mind, any and all colors from our color wheel can be expressed this way. 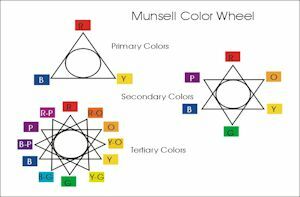 You can use the Munsell system to identify and mix the exact color you are trying to match in your subject., Ask yourself, “do I need to add more blue, red or nuetral? Is it higher or lower in chroma?” and most importantly, “is it lighter or darker?” By far, the most difficult to see and most illusive aspect of color is its value. But it can be learned, like a musician learns his scales. They train the ear to hear, we must train our eye to see.